Now, a little over a decade later, stockpiling is touted again, this time from new sources. For example, even the bestselling author of Rich Dad Poor Dad, Robert Kiyosaki, predicted an economic crash (“depression or hyperinflation”). Kiyosaki was so concerned about it that he has made the typical survivalist preparations for his household including guns (See video ). Which one is right? Of course, if you are an American like me, you hope “neither.” Neither of these pessimistic perspectives are what you were wanting to hear about your home country. You don't have to be an American to dislike the concept of such a large nation and its citizens going through such tribulation. Even selfishly speaking, the fall of America or the reserve currency of the world it produces would send the world into depression and chaos . Could something this devastating really happen to not just America, but the whole world—and soon at that? Since 1998 when I first heard the idea that America is actually spoken of in the Book of Revelation, I have only become convinced with even better evidence. The prophecy of Babylon the Great from Revelation 17-18 was mentioned earlier. Many think this refers to the Roman Catholic Church, the Vatican, or even Iraq  (home of Ancient Babylon, rebuilt by Saddam Hussein beginning in 1983). However, when you look at all the detailed clues and take them at face value, the best fit by far is none other than the United States of America. There is much more proof than this for the skeptical. Check out this list of dozens of proofs that point to America being Mystery Babylon the Great  (or find further unique proofs in my book ). The bad news is that both Jeremiah and Revelation leave no doubt as to the fate of America the Babylon. They give us specifics about exactly how it will happen. Jeremiah tells us a great nation, even an assembly of nations, will arrive from the north  (Jer 50:3, 9; 50:41; 51:48) and defeat her. Revelation tells us that the method of defeat will be fire and burning (Rev 18:8-9) and it will be in a single day (Rev 18:8), and completed within an hour  (Rev 18:10). But I know what you're thinking: Communism lost and collapsed and Russia became a democracy and would not want war now. The Cold War is over, etc. However, you have to look at what they are doing to prepare , not what they are saying. If you listen to the many high level Russian military defectors, they will tell you the Soviet war policy believes a nuclear war is winnable and they still have a plan for defeating the USA  with a nuclear first strike one day. If you don't find the theory of Russia plausible, keep in mind that it is does not matter exactly who the culprit is; America has plenty of enemies. What matters is that the Bible says the greatest nation of the end times will be defeated swiftly in one day just in time for the Beast to take over in the Great Tribulation. (For full details, see Know the Future ). That's very sad news to an American like myself; news that I am loath to share with other Americans. I'm sure most of you reading this are not pleased to hear it and are tempted to deny it or even to be angry at me for suggesting it. Yes, I know it's a huge downer; please don't shoot the messenger. The sad truth is that no matter how good America is to the rest of the world, in God's eyes it does not erase her extreme wickedness (see this article on America as Babylon  for a complete explanation). First, from Bible prophecy we can determine that, contrary to what the groups mentioned above predict, America's end is anything but soon or imminent. Revelation 14 shows that America's military defeat does not come until right before the Mark of the Beast  is released. In other words, when the Great Tribulation starts in the middle of the 70th Week of Daniel. The 70th Week of Daniel has not even begun yet. What's more, none of the 70th week prerequisite events have happened yet (Nuclear Middle East War , Third Temple , sacrifices for the Antichrist to stop, etc.). The defeat actually comes at the hands of the Antichrist and his “Ten Rulers”  (Rev 17:16-17), right before he sets up his own global military and financial empire to fill the void America leaves. Revelation 17-18 depicts Babylon as a whore riding or controlling the Beast which is why the Beast needs to remove her to be free. 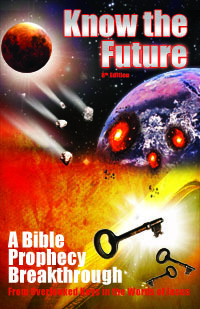 The prerequisite events that the Bible describes have not happened and leave no time for it to happen until near the end of the 2020's  (at the earliest...and very possibly at some other year later than that). The next article I wrote after this one answers the whole question of stocking up .